· From Ernest Hemingway: “The first panacea for a mismanaged nation is inflation of the currency; the second is war. Both bring a temporary prosperity; both bring a permanent ruin. But both are the refuge of political and economic opportunists.” This was true before WWII and is just as true now. · There are reports of a train load of American tanks passing through Latvia to Lithuania. · The US is trying to provoke Russia into war, perhaps nuclear war, through the use of sanctions, pressure on the exchange rate of the Ruble, weak oil prices, and military maneuvers. R. 758 overwhelmingly passed the U.S. House of Representatives on 4 December 2014. It brings the United States closer to a serious military confrontation with Russia. · The weekly silver chart shows important lows – in 2007, another in early 2010, another in mid-2012, and another about now. They are separated by approximately 128 weeks. 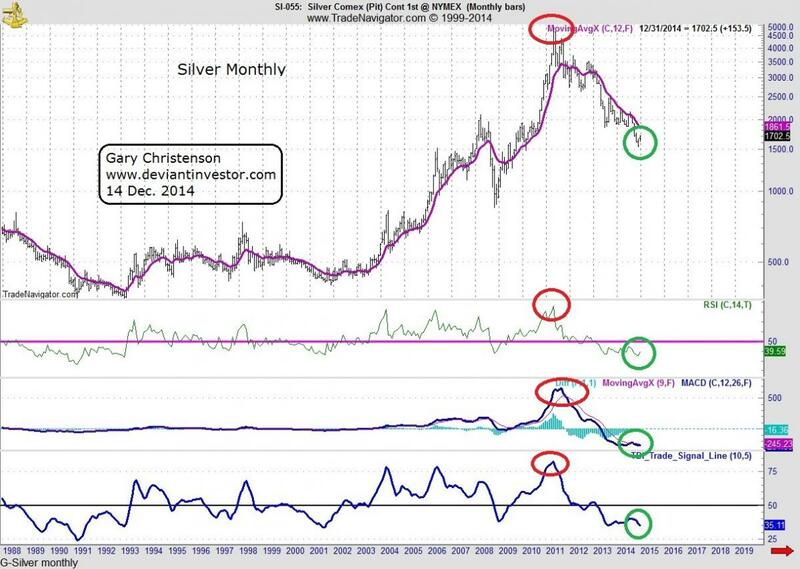 · The MONTHLY chart of silver shows deeply over-sold conditions in the RSI, MACD, and TDI. 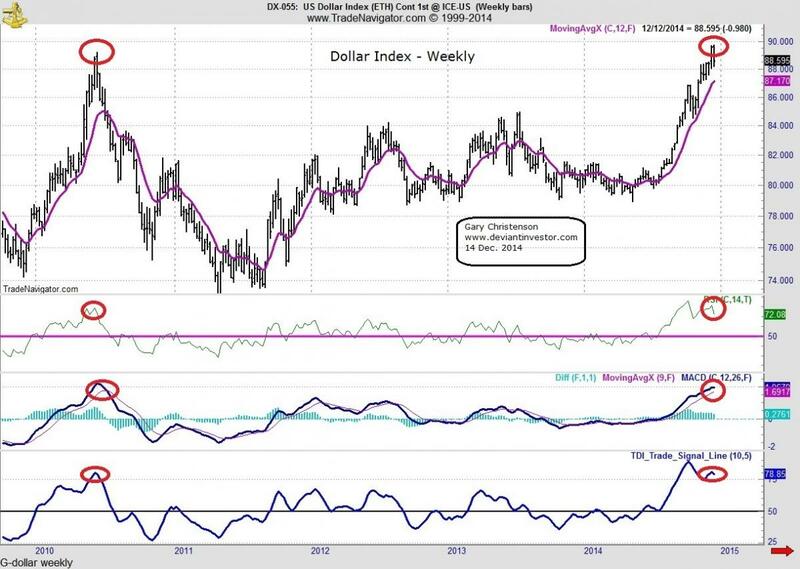 · The US Dollar Index is “over-bought” on the weekly and monthly charts. 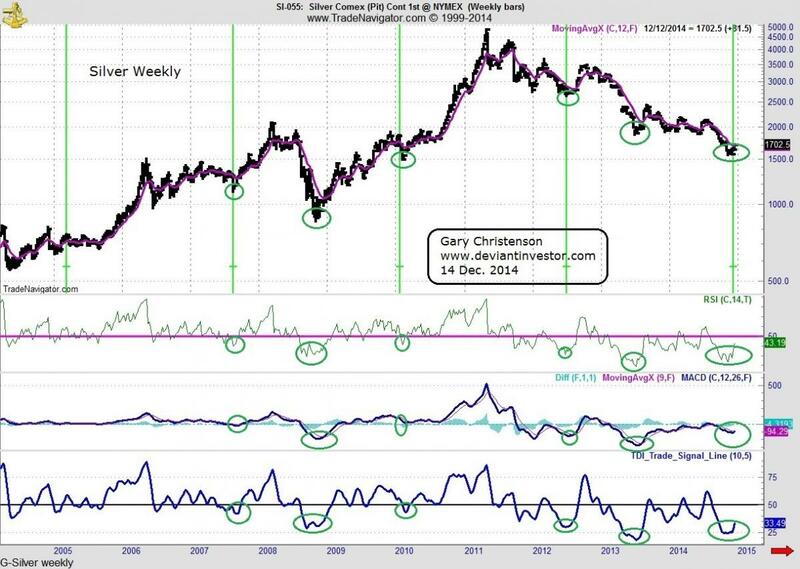 Note the position of the RSI, MACD, and TDI on both the weekly and monthly charts. The dollar will, sooner or later, turn down. 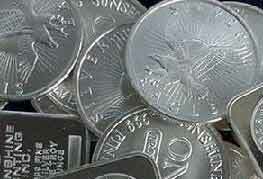 A declining dollar will be good for silver prices. · The US dollar index hit an important high in June 1989, another important high in March 2002, and another in December 2014. Those highs are 153 months apart. This could be significant. · “Why is China accumulating record amounts of gold? · Why is China working to accelerate its accumulation (of gold)? · Why are other countries hoarding gold? · Why are retail investors NOT selling SLV? · Why are bullion sales setting new records? · Why are some mainstream investors buying gold? All of the above should support long-term increases in the prices for silver and gold – which have NO counter-party risk. As an alternative to the above plan, I like and trust physical silver, held in a safe depository, outside the banking system. 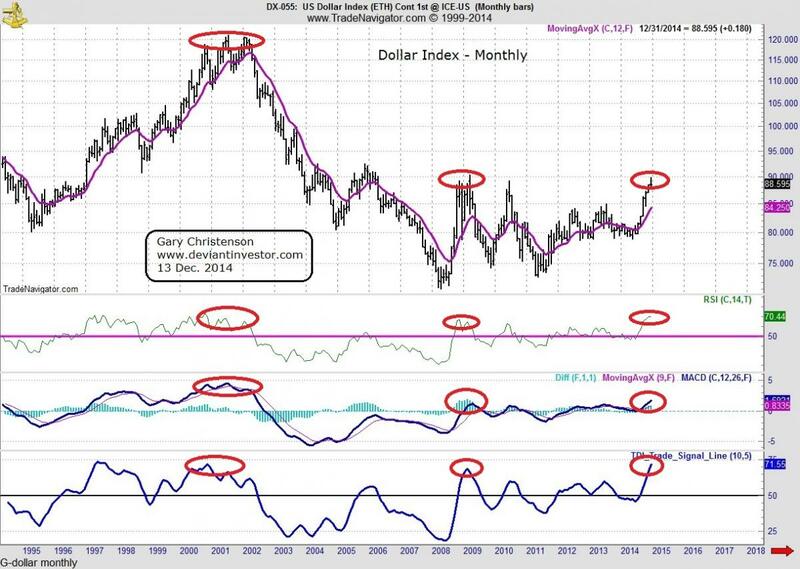 This entry was posted in news and tagged deflation, depression, dollar collapse, economic collapse, Economic Crisis, GE Christenson, Gold, gold manipulation, PMC Ounce, silver, silver phoenix 500, US Dollar on December 17, 2014 by Site Admin.